Chicago police are once again warning area merchants about burglaries to businesses that are occurring during overnight hours. 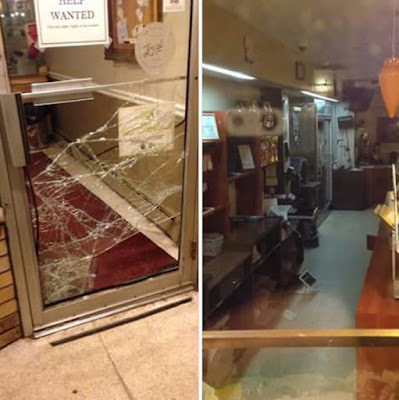 • The front glass door of Cutforth Hair Studio, 618 W. Addison, was found busted out Saturday morning. • Around 12:30 Saturday morning, burglars broke the front door glass of Lutz Bakery at 2458 W. Montrose. The offenders made entry to the bakery and tried to steal its cash register. Lutz has been operating in Lincoln Square since 1948. In an earlier alert last week, detectives warned of burglars breaking into local businesses through rear doors. Here is the text of the latest alert. A PDF version is available for download here. There have been recent overnight burglaries to retail stores in District 019. In each of these cases, an unknown offender shattered the front glass door/window of a business to make entry. • 3800 block of N. Broadway on July 5, 2015 at approximately 1:15 am. • 3400 block of N. Clark on July 6, 2015 at approximately 3:45 am. • 2900 block of N. Broadway on July 16, 2015 at approximately 3:45 am. • 2600 block of N. Clark on July 16, 2015 at approximately 4:15 am. About the Offender:In the incident on 06 July, the offender is a black male,5'08-6'00, 180-200 lbs, wearing a hooded sweatshirt and eyeglasses with thick black frames.